Good morning! I wanted to send a big thank you to both of you as well as your conference and banquet staff. We really appreciate all the hard work and flexibility that you and your team demonstrated with our group over the last week. Everything went very well and our event was a huge success. I cannot say thank you enough because I know that we can be a ‘needy’ group at times and I sincerely appreciate everyone who went above and beyond the call of duty for us. Please thank Andy and his banquet staff for all their help and flexibility as I know we had a tendency to run long a couple nights. I look forward to working with The Desmond in the future and we will be in touch very soon about a proposal for our May meeting.A big thank you again, and a shout out to James on your conference floor for all his help, what a great staff! I just wanted to take a moment to comment on the excellent staff at The Desmond. I was organizing my large Association event for this weekend and began planning last summer.Your staff was very professional and helpful – on top of everything I needed and heading issues off at the pass. When this event finally arrived, we checked in 168 people very smoothly and with no problems whatsoever.Although we are staying here tonight as well, I’m sure things will go as smoothly. Every person we had contact with last night and this morning was pleasant, helpful and went out of his way to be kind to this very large groups of teenagers. And the facility is beautiful. Excellent customer service is not always a given these days but I can see it is stressed at The Desmond and I really appreciate it. The comments and responses on our conference evaluations reiterate that fact that the success of our conference stems from the superior quality of hospitality and service The Desmond is known for. The Desmond truly makes it easy for CODY to shine in the eyes of our customers. …there was even mention that it was the bread pudding which ‘sealed the deal’ with a potential client. For the five years that I have been planning our company’s meetings and events, The Desmond has consistently exceeded my expectations for quality, food, service and hospitality. Whether my meeting or event is a small group of 12 for one day, or a group of 150 for four days, the staff at the Desmond makes my job virtually carefree. The staff is dependable, flexible and responsive. I know my meeting has been a success when I hear “great meeting” or “fantastic party” from my attendees. That is why we will continue to return to The Desmond year after year. The Desmond sales staff offers many options which provide us flexibility in keeping within our budget when planning our conferences. The staff always handles our last minute detail changes with speed, professionalism and a smile. The Desmond creates a comfortable, welcoming environment for all their guests. 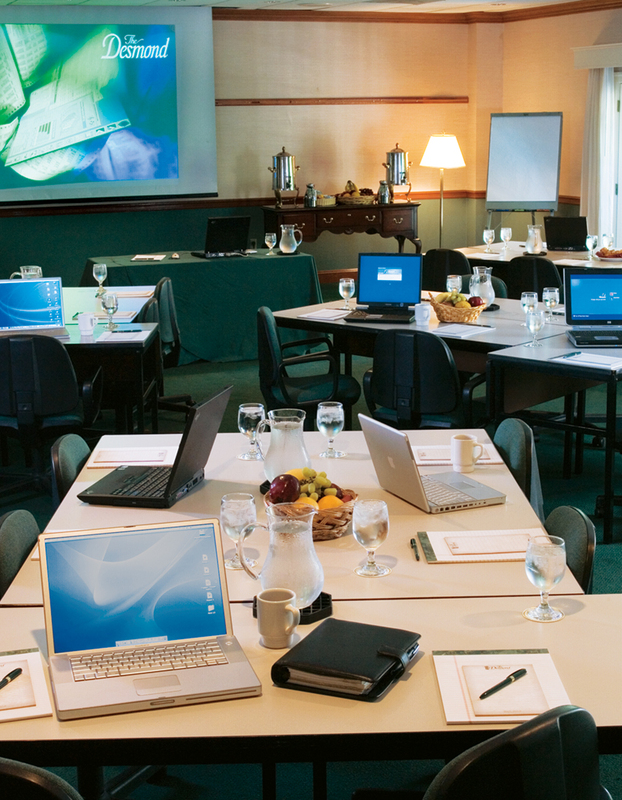 Three times a month, The Desmond welcomes Fox EMBA students to their conference center. The Desmond provides an intellectual, executive environment that removes our students from the distractions of everyday life and enables them to focus on their coursework. The staff is friendly and efficient and goes out of their way to make us feel right at home. Thank you again for everything last week!! Your efforts helped our event run pretty much flawlessly. All attendees were greatly impressed with the Desmond and all gave overwhelmingly positive feedback about it all around. We are already looking forward to planning next year’s event! Just a note of thanks for organizing a very successful event last evening for our company and third party owners. Everything was beautifully set up, organized, prepared, and presented; the bar tenders and wait staff did a top-notch job and were very professional. When I find my notes where I wrote down their names, I will certainly ask for them to assist with future event. The Weathervane room worked perfect and the tables were beautifully, and carefully set. Thanks to the service team for the quick order taking and to the chef and his team for fast service; the food was very good and I have received multiple compliments last night and already this morning. Another thanks to the team who assisted with the AV set up; all went well for our presenters. I just wanted to thank you and all the Desmond staff for another successful Conference. I couldn’t find Michael’s email address, but hopefully you’ll pass our praise along to him for creating such a well-run organization. It must be a good work environment, since we see many of the same faces, year after year. Again, thanks to you and everyone for all you do to make our events run so smoothly. We’ll see you again next year, and that’s proof positive of our satisfaction with the entire Desmond experience. I wanted to extend my sincere gratitude for all the work you did in helping to make everything run so smoothly this past week! From rooms to transportation to meeting facilities to our group meal on Thursday night, you made my job a lot easier. Even with last minute requests of dietary needs, your front office staff jumping in and helping me with my luggage, and getting me bottles of wine to present as gifts, everything fell into place. I cannot even begin to tell you how much I appreciate all your help! Everything that you and your staff did for me did not go unnoticed. I am grateful how every one of your employees was willing to go above and beyond to help me. Have a wonderful weekend and I look forward to working with you on the next project!